Caesars Entertainment is trying to convince a federal bankruptcy court judge to stifle lawsuits from burned investors. Caesars Entertainment is trying to save itself by convincing a judge to throw away a slew of lawsuits from burned creditors. Judge Benjamin Goldgar is expected to make that decision Wednesday in U.S. bankruptcy court in Chicago, where there's a hearing on lawsuits from holders of Caesars debt. The Las Vegas-based casino operator, filed for Chapter 11 bankruptcy protection on Jan. 15, but only for part of its debt. Caesars is hoping the judge will dismiss the lawsuits, because that could save the rest of the company from sinking into bankruptcy as well. 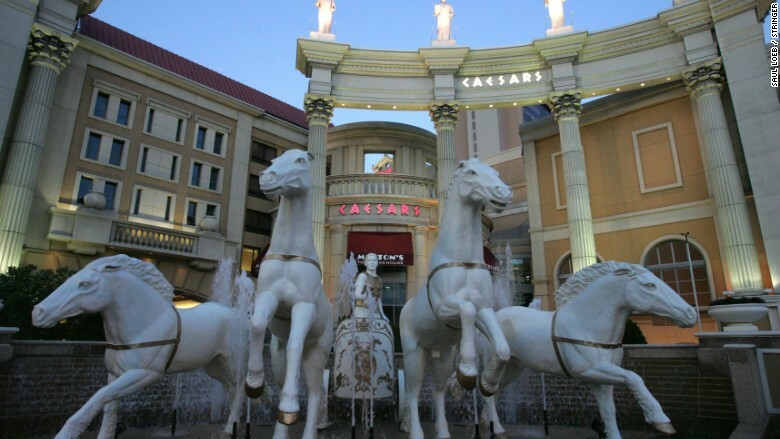 Caesars said on Monday that it's trying to make a deal with creditors by offering them up to $400 million, which is only a tiny fraction of the $10 billion in debt it is trying to erase through bankruptcy. Caesars (CZR) has $18.4 billion in total debt. If it can restructure $10 billion of that debt, it would reduce its annual interest payments to $450 million from $1.7 billion. The stock fell 22% on Wednesday. Chapter 11 bankruptcy is the last resort for the firm, which has been struggling financially since a buyout by private equity investors Apollo Management and TPG Capital in 2008, when the nation was in the throes of a financial crisis and casinos were struggling to pay off their debt. The company's casinos in various cities, including Las Vegas and Atlantic City, have continued to operate.